"Absolutely stunning" is a fair description of the Bismarck palm. This massive silvery/blue green palm commands attention and inspires awe wherever it is grown. The Bismarck palm's stout trunk and gigantic crown lends a formal note while the startling blue green foliage amplifies the visual impact of this big, tropical beauty. This palm may eventually reach an ultimate height of 50 feet (with a spread of 20 feet) but decades will pass before reaching that height. The Bismarck is not suited for use in inland Texas unless it is planted somewhere that is well protected from winter freezes but in the coastal regions where freezes are not so severe, the Bismarck will fare well. Bismarck's survive freezes in the low 30's/high 20's with little damage and survives freezes into the low 20's with various degrees of frond damage all of which usually grows out over the following season. Bismarckia nobilis is native to the island of Madagascar off the east coast of Africa. This palm is adaptable to many kinds of soil but does best in sandy or loamy soils that are well drained. Prefers full sun but is tolerant of some shade. 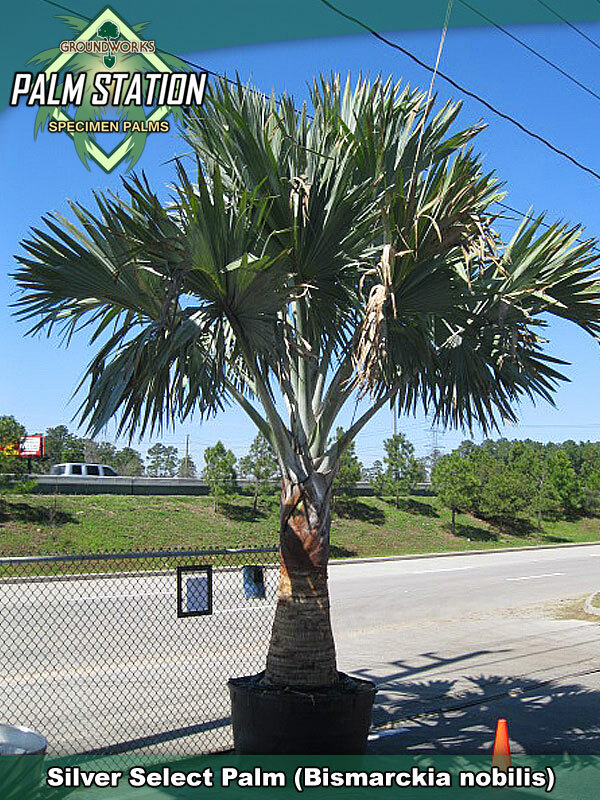 Once established this palm is drought tolerant and does not do well long term in a constantly wet soil environment. The book on this species says Zones 10 - 11 but we are aware of many sites in Zone 9 where Bismarck's have thrived for years & years. Direct experience makes us very comfortable stating that the venerable Bismarck will do well and be a safe investment anywhere in Coastal areas near Houston and anywhere in the coastal regions south of Houston. 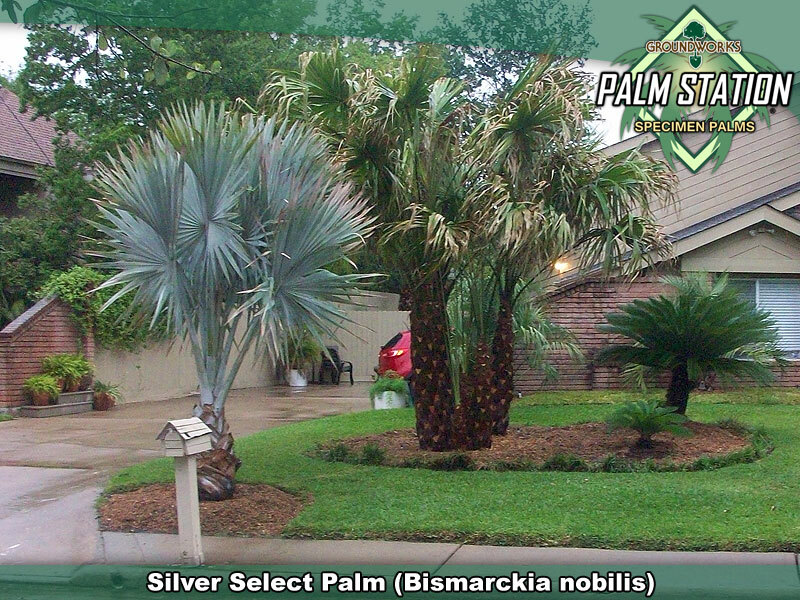 Groundworks Texas and Groundworks Palm Station - Houston have excellent availability of specimen Bismarck palms up to 5' of clear wood (14-15' overall height) and larger specimens are available upon request.